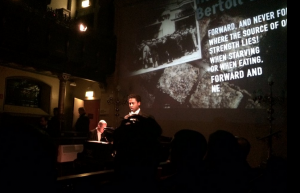 To the Manchester Jewish Museum, on Holocaust Memorial Day, for a concert of music condemned and banned by the Nazis as “degenerate.” This was a bold move by the museum, which has decided to host more events to gain attention ahead of a big rebuilding programme. After a glass of (kosher, of course) wine, we were invited in, to find the inner space dominated by the famous poster which was used as part of the Nazi campaign against music of any kind which did not suit the Nazi philosophy. 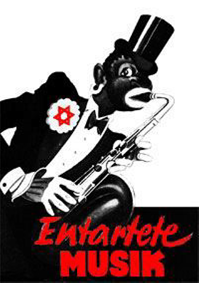 The campaign, during which concerts were held in which the music was vilified, ran parallel to the “Entartete Kunst” exhibition, which condemned virtually all experimental art, particularly that produced by Jews. Brathwaite, of whom I predict great things, is an assured and accomplished performer. His German pronunciation is excellent, and he attacked each song with relish, really bringing out the savagery of the satire, and the black humour too. It was great to hear the Brecht / Eisler “Solidarität” from the wonderful film Kuhle Wampe as a song in its own right. 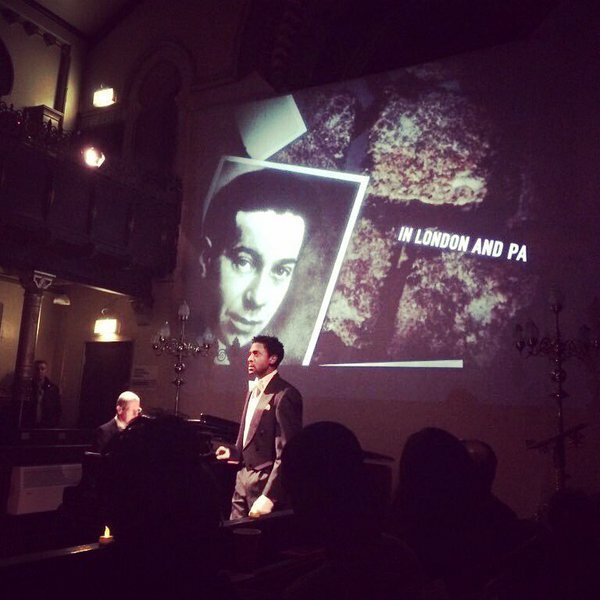 And, inevitably, we finished with Brecht and Weill’s “Mackie Messer”, a song whose bizarre transition into a standard easy-listening tune about mass murder deserves a post of its own. Peter Brathwaite, on this showing, is a star in the making. I would love to have a recording of his versions of these songs, and surely that will come. In the meantime, he tells me, we will be able to see some footage filmed on the night. I look forward to that immensely. Entartete Musik by Dr Rob Spence is licensed under a Creative Commons Attribution-ShareAlike 4.0 International License.